BIOSTAT® A is an entry-level bioreactor | fermenter designed for easy control of cell growth and fermentation. It is therefore ideal for educational purposes. The new aeration system of the BIOSTAT® A provides continuous automatic flow control over the full range of each gas used. As a result, BIOSTAT® A does not require any manual adjustment of flow meters and therefore eliminates problems with pulsed aeration. Setting up the bioreactor is straightforward: Just connect the aeration tubing, configure the aeration profile, enter the DO setpoint – that’s it! For cell culture applications, interfaces for four gases (air, O2, CO2 and N2) are available for DO and pH control. The microbial version features two gas lines (air and O2) for DO control. Allows fermentation in any laboratory and minimizes water usage. You won’t need to worry about finding a suitable water cooling source for your bioreactor. Thanks to the intuitive user interface, operating the BIOSTAT® A is ideal for beginners, reduces operating errors and speeds up training. Save your process data directly on the BIOSTAT® A; then easily transfer this data to your PC or laptop spreadsheet application for convenient analysis. BIOSTAT® A is equipped with digital pH and DO probes. These help you immediately recognize whether you can use a probe for the next cultivation batch. Install tubing in three seconds: Open, insert tubing, close – done! No more pinched fingers, torn gloves or tubing slippage in the peristaltic pump head. Select the type and size of your culture vessel on the BIOSTAT® A menu, and all settings including PID parameters will be automatically adjusted. The Advanced package version of the BIOSTAT® A with fed-batch control lets you achieve higher cell densities than with standard batch control. Easily implement substrate profiles in the menu to control an external variable-speed pump. 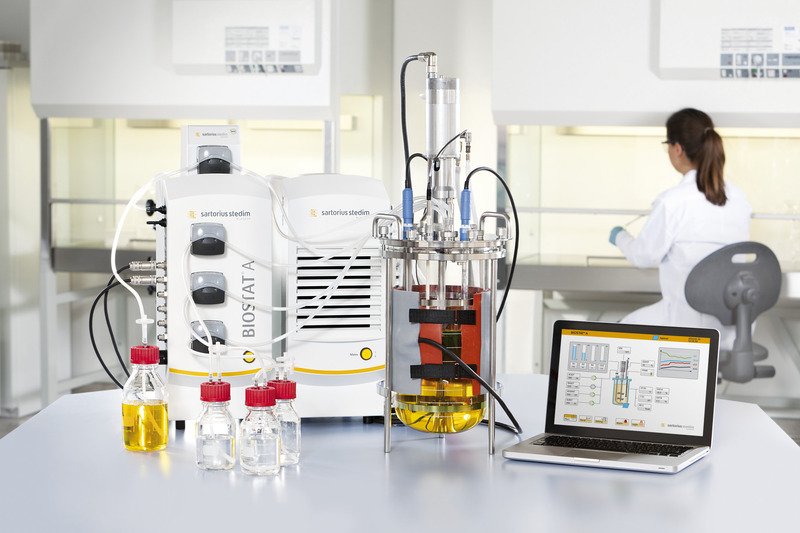 The BIOSTAT® A is available with single-wall glass vessels in a choice of working volumes of 1, 2 or 5 liters maximum. Whether you select our reusable UniVessel® Glass version or our disposable UniVessel® SU unit with a maximum 2-liter working volume, you can use the same system controller. Both the UniVessel® Glass and the UniVessel® SU feature the classic stirred-tank design to give you comparable results. The advantage: The same motor drives the stirrer of both vessels so you can easily change over from reusable to single-use or vice versa. Perform screening studies efficiently with multi-parallel cultivation. Screen your process variables and define the conditions for optimal cell growth and enhanced protein expression. Download your trial data from the BIOSTAT® A to your notebook, tablet or smartphone. For fast and accurate analysis of your data, use our Chemometrics Toolbox installed on your notebook or PC. The BIOSTAT® A speeds up training on bioreactors, which makes it ideal for beginners in fermentation. Have a look to the application note in the download section and see for oneself that this bioreactor brings all necessary characteristics with one to perform challenging fed-batch microbial cultivations. The greatest advantage of the BIOSTAT® A is the included chiller unit, which provide cold water without a direct connection to a water supply. The BIOSTAT® A provides an easy to use and reliable stand-alone solution for control of mammalian cell cultivations. The descriped experiment in the application note (see download section) comprises cell growth and protein production phase with temperature shift. The kLa measurement could be done perfectly.